Auntie Cori and Cousin Finn visit for Peepaw’s Birthday! Video 1: Dad as he discovers that all his kids and grandkids are in town for his birthday. Video 3: An unusual mid-March heatwave provided a unique opportunity to bathe all the grandkids together in a kiddie pool on the back deck. 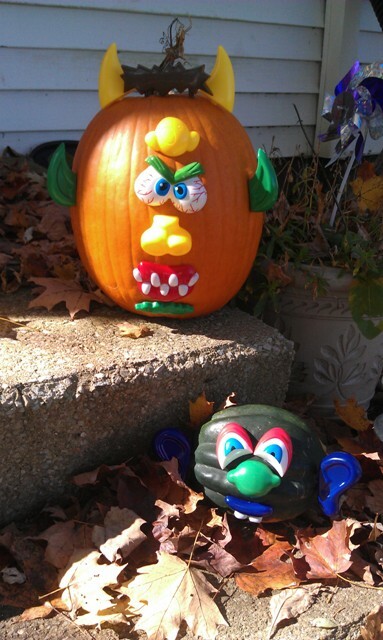 We skipped the messy carving this year, and got a set of pieces that you press into the pumpkin. It is a lot like a Mr. Potatohead…and probably falls into the category of cheating…but it was so much easier!!! Dakota decorated a pumpkin that we grew in the garden this year (the ONLY pumpkin that grew in the garden this year). For Caitlin, we decorated an acorn squash that the neighbor grew back by the pond. They turned out pretty funny. 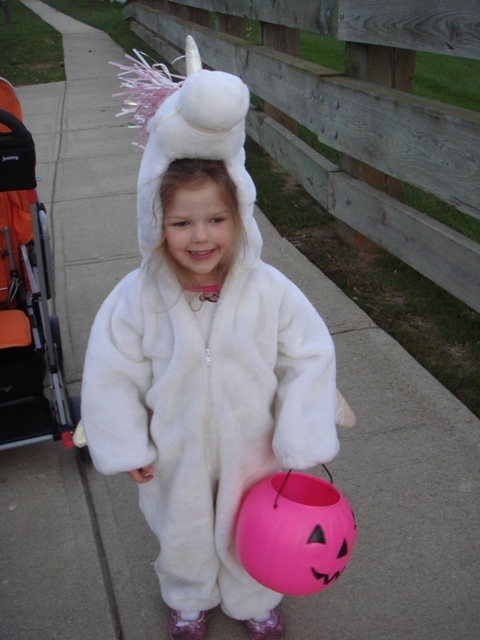 For Trick-or-Treat, Dakota was a “Magic Flying Unicorn” and Caitlin barely fit into her “Ladybug” costume. 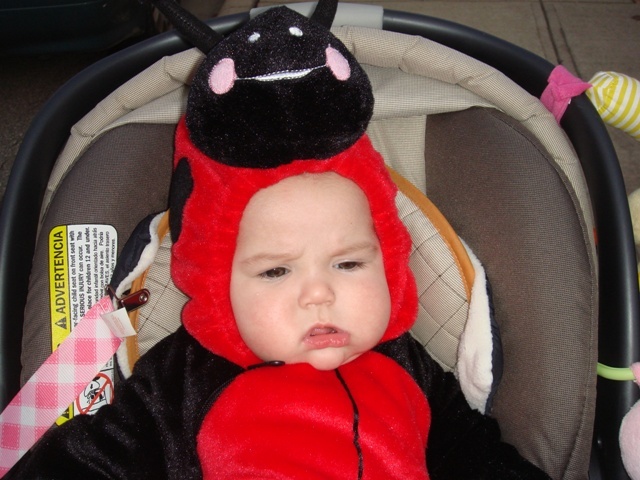 Apparently, buying a baby costume a month ahead of time is risky…she has been wearing size 6-9mos for a couple of weeks now, and the costume is a 3-6mos. Her legs have to cross in the bottom, but she doesn’t seem to care. 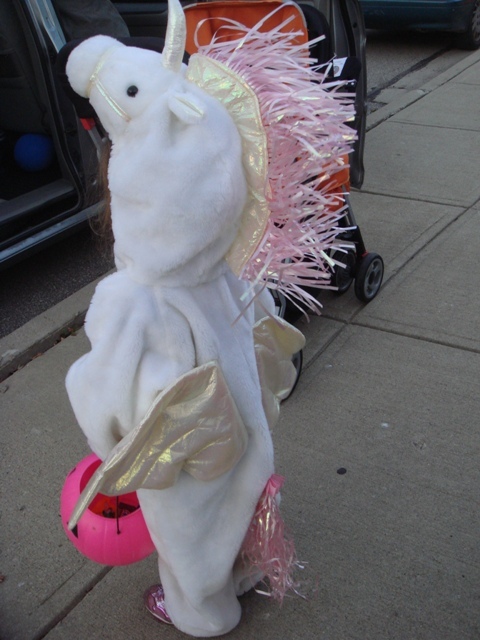 The unicorn's wings, tail, etc. 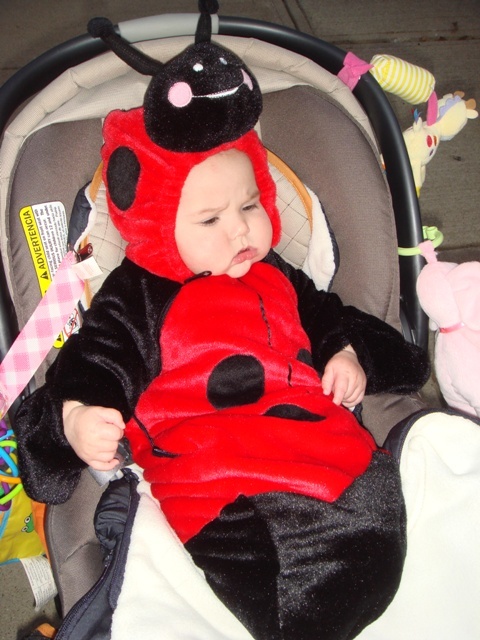 Our little ladybug....she wasn't real excited. Caitlin’s legs are getting very strong these days, as she practices jumping in her “jumperoo.” She’s got some serious wiggles these days, and we are glad she has this as a way to use up all that extra energy! 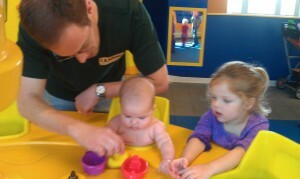 Last weekend, we took the girls to COSI. 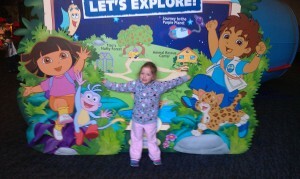 Dakota was very excited about the “Dora and Diego” character exhibit. Welcome to the Dora & Diego Exhibit! Caitlin enjoyed the baby water table. Splash! She loved this water table. She was cold and wet by the time she was done, but screamed when I took her out. McKee Meadows by Themebuilder | Entries (RSS) and Comments (RSS).